This past weekend we drove up to New Hampshire to visit my mother, and she and her husband took us to dinner for our anniversary at the lovely Oxford House Inn in Fryeburg, Maine, which is a short drive from North Conway. We arrived a little early for our 6:30 reservation, but there was no problem being seated right away, and both the hostess and server were very accommodating when we said we’d probably sit with a cocktail for a bit before ordering; we never felt rushed at all. Once we settled in with our drinks and enjoyed the view from the back room overlooking the beautiful scenery for a bit, we finally decided on some appetizers. Both my mother and Rob had the crispy Maine crabcake appetizer, served with celery root slaw and lemon aioli. 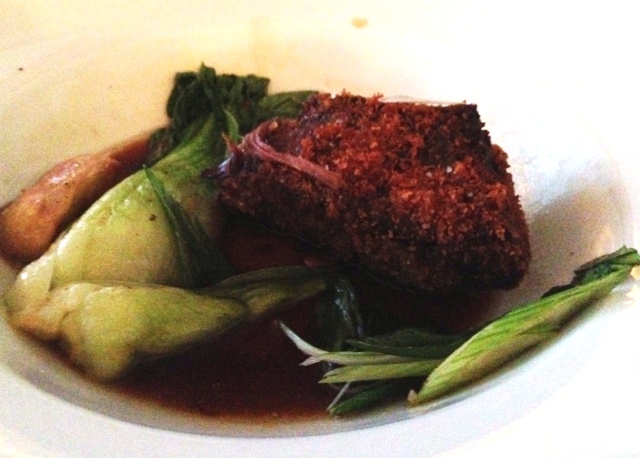 Andrew ordered the Vietnamese beef short rib, which came with a pho broth, bok choy and Japanese turnip. I had one of the three salads on the menu: organic field greens with a delicious buttermilk dressing, radishes, peas, and Hazen blue cheese. All of the dishes were delicious, as evidenced by four completely empty plates. For entrées, three of us ordered the same thing–the filet mignon–and for good reason. My mother had ordered it before and said it was “to die for”, and that’s a pretty accurate description: espresso-rubbed and melt-in-your mouth tender, with a delicous bordelaise sauce. It was served with what I thought was one of the best potato sides I’ve ever had, a potato and blue cheese gratin, cooked perfectly not at all mushy, as well as half of a long, thin grilled summer squash. The presentation was beautiful but you’ll have to take my word for it because I didn’t get a good photo of it. I almost forgot to mention the lovely salted honey butter they served with the rolls, which were brought out before our appetizers. The wine list at Oxford House is quite nice, and included a good selection by the glass, too. I had an excellent Provençal rosé with my salad (not on their online list and unfortunately I don’t recall the name), and then the Angeline Pinot Noir (CA) with my filet. Rob tried a local beer, Tuckerman’s Pale Ale. The food was so delicious and decadent, there was little room for dessert, but my mother and Andrew split a creme brûlée that I had a bite of and was well worth the extra calories. My dessert was liquid: a Joseph La Magia Botrytis Riesling, that was a perfect ending and just sweet enough. Rob opted for one of their four ports, the Taylor Fladgate 20 year tawny. Now, this was obviously a “special occasion” meal, and we splurged a bit with our selections, but there were also some budget-friendly items on the menu, too, including “bistro plates” such as a steak frites, sandwiches and share-able items if that’s more your speed. And while we ate in the main restaurant, there’s also a more casual pub downstairs. All in all, a fantastic meal at a lovely country inn that I’d happily return to anytime, for any type of meal.